The ability to make phone calls has become just an afterthought with today's cell phones. They have evolved into smartphones that are used for a variety of tasks. You can even use them as a remote control for TVs, home theater, and home automation systems. Check out some interesting remote control apps that make operating your home theater system easier. Thorough technical support and online documentation. Frequently updated to support new devices. Comes with a learning curve. May have more features than you need if you just want a TV remote. Having a table or drawer cluttered with remotes for your TV and other components is definitely not desirable. You can opt for an expensive custom-installed home theater/home control system which requires a lot of in-wall wiring, but there is an easier solution, the Harmony Remote Control System. 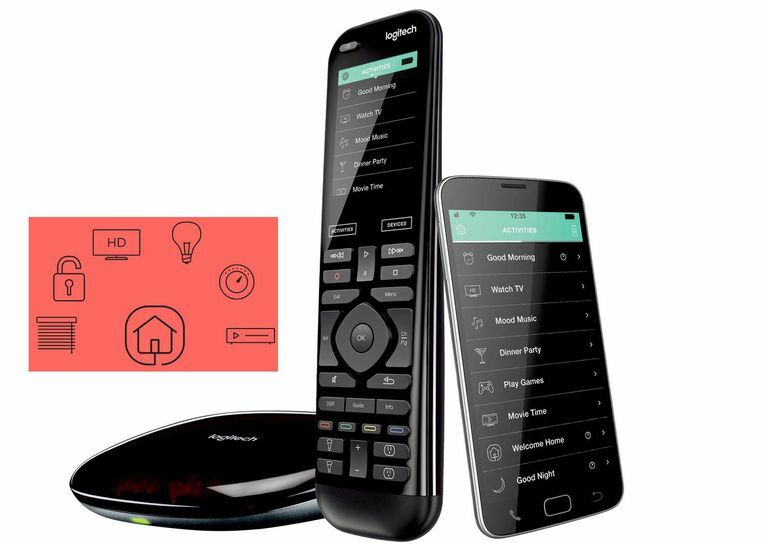 Logitech combines IR and WiFi control hardware with iOS and Android Apps that allow your compatible smartphone to control multiple home theater components, as well as other smart home devices, such as lights, thermostats, and locks. Devices can be controlled individually or combined into "activities". For example, you can program the app to "Watch TV". Working through compatible Harmony Remote products it will turn on the TV and Blu-ray disc player, turn off the lights, and close the blinds. The apps have access to the Harmony Remote Control Database, which includes codes for over 270,000+ consumer electronics, home theater. and smart home devices. The Harmony Remote Control app is compatible with their Elite, Companion, Hub, Home Control, Pro, Smart Control, and Smart Keyboard. Easy integration with hundreds of third party devices. Alexa can also answer your questions about the weather, traffic, and other topics. Learning the appropriate voice commands requires some trial-and-error. Alexa isn't quite as smart as Google Assistant. The Alexa app is one of the most versatile remote apps available. Once downloaded to either an iOS or Android phone, you can link it to Amazon's Echo (and some third party) devices (such as select Logitech Harmony Remotes ) and from there, just enable any one of several Alexa skills. Using voice commands, you can easily manage content and some basic control features for compatible TVs, home theater receivers, multi-room audio systems, environmental devices, locks, and more. Some of the brands and products that "Works with Alexa" include Sonos, Onkyo, and Pioneer Home Theater Receivers, Denon HEOS and DTS Play-Fi wireless multi-room audio platforms, select Logitech remote controls, Samsung's Smart Things, and more. If you have a device that is Alexa-compatible, take advantage of the Alexa App. Can answer almost any question thanks to the Google Knowledge Graph. Works with more mobile devices than Alexa. Can't do everything Alexa can do such as note taking. The Google Assistant app, through Google Home or Google Assistant-enabled device, allows your voice to control and manage content access and basic control features on home theater devices that have Chromecast Built-in, which is available of growing number of TVs, home theater receivers, soundbars, and other components from brands such as LeECO, Philips, Polaroid, Sharp, Sony, Skyworth, Soniq, Toshiba, and Vizio. LG products don't have Chromecast Built-in but are compatible with Google Assistant. Google Assistant is not compatible with Samsung TVs and home theater products. In addition, Google Assistant can be used to operate a growing number of smart home hubs and devices, including lights, switches, plugs, locks, camera, and air-conditioners and heating systems. The Google Assistant app is available for both Android and iOS. Does everything a physical Roku remote does and more. Easy to control multiple Roku TVs and Devices chosen from your list. Works better on iOS than Android. With the proliferation of Roku media streaming sticks, boxes, and TVs with Roku features built-in, the free Roku Mobile is the perfect companion to have on your iOS or Android phone. In addition to standard remote control features, the Roku Mobile app provides its own voice control option as well as tap-able control icons. The Roku Mobile Apps sees all the apps you have installed on your Roku device, and you can also use it to add more. The Roku Mobile App also allows your share music, video, and photo content from your phone with your Roku device, as well as providing a private listening mode. Plug in a set of earphones to your smartphone and you can listen to sound from your favorite apps without disturbing others. Extremely easy to set up. Constantly adding support for new devices. Randomly "forgets" your custom panel settings. Occasional glitches force you to restart the app. With both IR and Wi-Fi ,support Sure Remote can control most home theater and smart home devices. This includes TVs, cable/satellite boxes, home theater receivers, Blu-ray/DVD players, media streamers and more. For added flexibility, Sure Remote also supports Alexa Voice control. Also, DLNA networking allows you to browse audio and video files on your smartphone, computer or NAS and stream audio, video, and still image content to smart TVs and other media playback devices, such as Roku. You can even use Sure Remote to copy files from shared folders back and forth between your network devices and your smartphone. The user interface may not be as colorful and many apps, with the Sure logo appearing on almost every page, but the tap response is exceptionally fast and it is easy to use. Sure Remote is freely available for both iOS and Android smartphones but does display periodic ad, with in-app purchase support. It is also important to note that your phone must have an IR blaster built-in in order to control IR-only devices. TV guide feature offers personalized viewing suggestions. Lets you watch YouTube content on streaming devices. Adds an annoying lock screen overlay to your device. The Peel Remote app uses either IR or Wi-Fi to control devices. It can control most home theater components, such as TVs, DVD/Blu-ray Disc players, streaming media players (Apple TV, Roku, Chromecast), as well as select smart home appliances, such as air conditions and heaters. You can also enter your antenna, cable, or satellite service and Peel will provide you with local channel listings, along with viewing recommendations, including "trending now" and "recently watched" programs. Peel also provides listings for several popular streaming services, such as Netflix and Hulu. However, the downside is that Peel sprinkles in periodic Ads. Since the app is free, that is "price" you pay to use it. Offers more functionality than the factory Onkyo remote. Gets better with each update. UI is attractive but poorly designed. Owners of Onkyo 2009-2016 network home theater receivers can use the Onkyo Remote (Android) or Remote 3 (iOS) app while owners of Onkyo home theater models released after 2016, need to use the Onkyo Controller App for iOS or Android. The apps provide access to a variety of functions on select Onkyo home theater products (such as home theater receivers) including volume, input selection, radio tuning, navigating internet radio and streaming services, and more. The apps can also control Blu-ray disc players and TVs that are connected to an Onkyo network receiver via HDMI-CEC. In addition, you can use the app to stream music from your smartphone to a compatible Onkyo home theater receiver or other components, as well as stream audio files from DLNA-compatible servers (such as a PC or NAS). The files can be streamed from the servers for listing on your smartphone or directed from the service to compatible home theater receivers or other components. Supports more than a dozen languages. Simple UI is easy to navigate. The volume control buttons are very tiny. You must regularly update the firmware for it to continue working. If you have a home Wi-Fi network, this app for both iOS and Android allows users of select Yamaha home theater receivers to control basic functions such as input selection, volume, listening mode selection, zone power, and settings for connected Bluetooth devices. The app also allows control of Internet Radio, FM/AM, and playback from connected USB flash drive. The Music Play function also allows you to stream music from your phone to Yamaha Network receivers. Easy to control and customize individual speaker settings. Doesn't save custom audio settings. Pioneer offers a series of remote control apps that users to control select Pioneer home theater components (depending on model year). These apps not only provide basic control but can aid you in setting all your audio and video parameters, including speaker setup, surround sound listening modes, and both audio and video processing. Works from long distances if you have a strong Wi-Fi connection. Here is an app that allows the user to control devices that have been integrated into a Control4 home automation system. Depending on what is part of the system, this app can control audio and video components, navigate and manage content access, as well as lighting, heating, air conditioning, and more. The app is available for iPhone, iPod Touch, Fire tablets, Android devices, and even PCs, and Macs. What is Sonos and How Do You Set It Up for Home Audio?